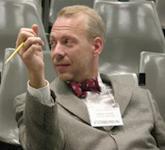 “A Political Theory of Geeks and Wonks” by Jeffrey Tucker, editorial vice president of http://www.Mises.org., is one of the best articles ever posted at LRC. It neatly sums up the psychological and philosophical dichotomy between Pragmatists and Idealists. It correctly affirms that despite appearances, Pragmatists do not have their feet on the ground, and Idealists do not have their heads in the clouds. It has far-reaching implications for the Democratic status quo and the inevitable Market Anarchist political future. Market Anarchist Geeks may strike Democratic Wonks as Ivory Tower Utopians. But in fact Market Anarchist Geeks grasp the comparative merits of political systems far better than “realpolitik” Democratic Wonks. Market Anarchist Geeks know that the structural defects built into conventional monopolistic forms of government such as Democracy doom them to eventual, inevitable failure. They know that in the long term, mankind will have no alternative but to adopt Market Anarchism, the only political system completely consistent with natural rights and individual sovereignty.